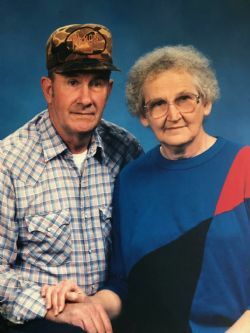 Anna Sue Tilley, age 88, of Flippin, Arkansas passed away February 9, 2019 in Flippin, surrounded by her husband of 67 years, her children, grandchildren and nephews. Anna was born on October 16, 1930 in Calico Rock, Arkansas to the late Jesse Lewis and Alma Euphemia (Ivie) Merchant. On May 10, 1952, Sue married Nemo Tilley in Mountain Home, Arkansas. They had four children, Joann, Robert, Glenda and Kenneth. She was a lifetime resident of the area and an employee of LaBarge Electronics and Baxter Health Care. She loved her family and friends and was always sharing stories of her life with all that she loved and knew. Sue loved crocheting, quilting, crafts and gifting her treasures. Mrs. Tilley is survived by her husband Nemo of Flippin, Arkansas; son, Kenneth (Natalie) Tilley of Nixa, Missouri; two daughters: Joann Perry of Flippin, Arkansas and Glenda Huckabee of Gassville, Arkansas; six grandchildren, fourteen great grandchildren and two great great grandchildren. She is preceded in death by her parents; sisters: Lorene Dillard, Louise Cothern, and Nelda Collins; brothers, Pete and Bill Merchant and one son, Robert Tilley. A visitation will be held on Monday, February 11, 2019 from 6:00 – 8:00 pm at Roller-Burns Funeral Home in Yellville, Arkansas. Funeral Service for Mrs. Tilley will be held on Tuesday, February 12 at 2:00 pm at Roller Burns Funeral Home Chapel. Interment will follow at Hurst Cemetery in Flippin, Arkansas.